Pew’s State of the Media: Newspaper Fact Sheet came out last week. Taken as a whole, the report shows further evidence of an embattled industry, where employment has dropped 45 percent since 2004. But it’s not all bad news. Pull some of the individual news organizations out, and you get a more nuanced picture. For example, accounting for digital circulation booms at The Washington Post, The New York Times and The Wall Street Journal, weekday digital circulation rose 10 percent from 2016 to 2017. And while revenue from digital advertising made up 17 percent of newspaper ad revenue in 2011, it made up 29 percent in 2016 and 31 percent in 2017. There is hope: LION, a group that represents local online publishers, saw its membership rise in 39 states. In other union-related news: More than 400 unionized employees of the Washington Post have signed a public letter asking for a raise. Uber is set to disrupt another industry: the magazine business. The ride-sharing tech company is launching a magazine, titled Vehicle, in several major cities for drivers and riders. A mix of journalism, poetry, and more branded content, the publication already has published two initial editions focused on Seattle and Washington, D.C., both of which shipped to some local offices last week. Although the magazine primarily is “staffed” by a few people from Uber’s corporate branding department, the articles are authored by freelancers and local journalists — many with respectable media pedigrees and bylines at prominent publications. Read more: It’s not Uber’s first foray into the media business. In 2015, the company launched a quarterly magazine for its drivers. In January, the U.S. Department of Commerce announced tariffs on Canadian newsprint high enough to cripple the print publishing industry. Now, Congresswoman Kristi Noem and Congressman Charlie Crist have introduced the “Protecting Rational Incentives in Newsprint Trade Act of 2018,” or “Print” Act, in an attempt to protect publishers and printers from the tariffs. 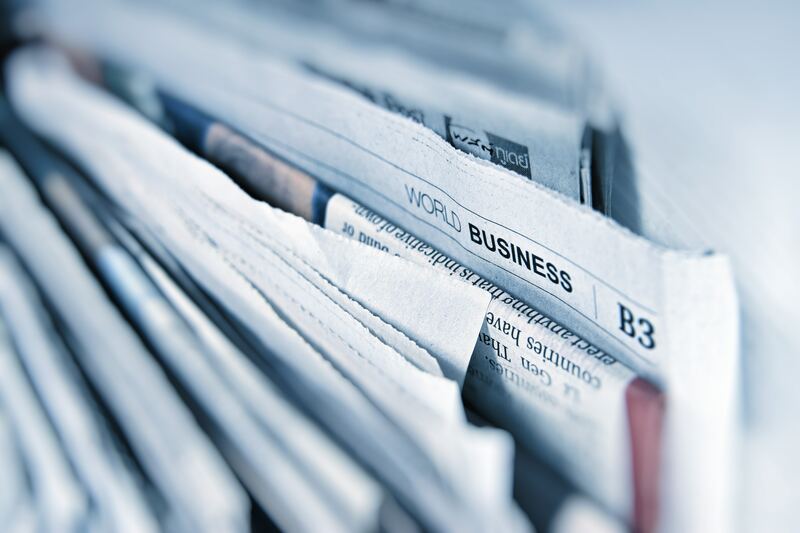 The Act would demand the Department of Commerce complete a study to explore the types of damage the tariffs cause to local news coverage, including reduced employment or harm to local businesses that advertise in their respective papers. Earlier this year, the Tampa Bay Times laid off a portion of its staff and said the tariffs were to blame. Patrick Soon-Shiong has finally completed his $500 million purchase of the Los Angeles Times, San Diego Union-Tribune, and other papers from Tronc, and sources say the rest of the company now might also be on the block as well. There are nine papers remaining in the Tronc chain, including the Chicago Tribune, New York Daily News, Baltimore Sun, Hartford Courant and two papers in Florida, the Sun-Sentinel in Fort Lauderdale and the Sentinel in Orlando. Tronc also recently added The Virginian-Pilot. Among the potential suitors that have been circling while the California newspaper deal was being finalized are two investment firms, Apollo Global Management and SoftBank, the backer of New Media Co., which took over GateHouse Media. At least one other venture firm is said to be circling as well. Meanwhile, four former Time Inc. titles being auctioned off by Meredith are drawing interest. Maria Perez is Director, Web Experience & Operations at PR Newswire. An animal lover, she curates content for @PRNPets – that is, when she’s not busy cuddling with her 10-year-old blind Maltese, Toody. ← Love pop culture? Here are 5 ways to stay informed.